Neptune Chain Saw is a efficient equipment for cutting fresh or dry trees or wooden logs.. It is endowed with high powered engine with high speed chain cutter.. This product provides more productivity with less manual efforts..
Recoil starter available in Magnesium body. Hi-quality Bar and Chain for long term service. cutting fresh or dry trees or wooden logs. 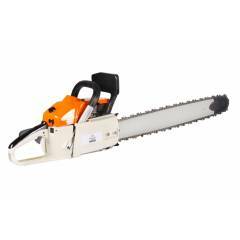 Best Sprayer 62 cc Chain Saw is a premium quality Chain Saws from Best Sprayers. Moglix is a well-known ecommerce platform for qualitative range of Chain Saws. All Best Sprayer 62 cc Chain Saw are manufactured by using quality assured material and advanced techniques, which make them up to the standard in this highly challenging field. The materials utilized to manufacture Best Sprayer 62 cc Chain Saw, are sourced from the most reliable and official Chain Saws vendors, chosen after performing detailed market surveys. Thus, Best Sprayers products are widely acknowledged in the market for their high quality. We are dedicatedly involved in providing an excellent quality array of Best Sprayers Chain Saws.